The team of RoyalOne Productions is thrilled to announce our line up for our 2019 Season. 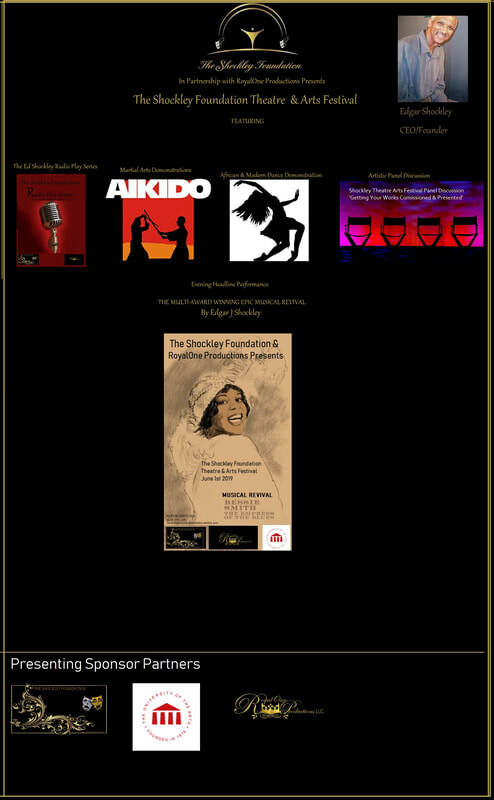 We begin the year in partnership with The Shockley Foundation in February that will present The Shockley Foundation Theatre & Arts Festival. This epic festival will feature a full day of Artistic greatness in tribute to the legendary National Award winning Playwright, Author, Screen & Television Writer and Actor Edgar Shockley. Highlighted will be the Radio Plays 'Pop Edwards' & 'The Greatest Life That Never Was'. In addition there will be a special viewing of Artistic Film Shorts, Artistic Panel Discussions and the headlining event of the Epic Musical Revival of ' Bessie Smith Empress Of Blues'. RoyalOne Productions will be rounding out the end of the Summer 2019 Season will be a stellar theatrical event presenting the Broadway Musical 'Jekyll & Hyde' in Concert. Ushering in a historic fall 2019 RoyalOne Productions will be partnering with The National Marian Anderson Museum & Historical Society in October 2019 to present George Gershwin's momentous Opera 'Porgy & Bess' In Concert. This is a New Season that you don't want to miss. Make sure you Subscribe, RSVP & Confirm your Tickets Today!